You’ve got hungry visitors on your hands, and possibly wary ones too after all the tales they’ve heard about scorpions on skewers, entrails of all sorts, and dog and donkey burgers. But we Beijingers know just how tantalising and surprising the cuisines of the capital can be. So, cross off the weird and wonderful, and show those tourist taste buds a good time. Yes, Beijing is the melting pot of all the fabulously varied provincial flavours. But there’s truly no better start than the Peking duck. Forget the crispy aromatic versions of China Towns in far flung countries. This is the real deal. There’s a reason why Da Dong almost always has you queuing. The star of the show is famous for the crisp bite of the skin that gives way to melting on your tongue, but never leaves your palate saturated. A small serving of sugar is for dipping the skin and eating it solo for the purest taste. Then progress with your pancakes through the selection of the savoury-sweet duck sauce and mushy garlic for a fuller flavour. 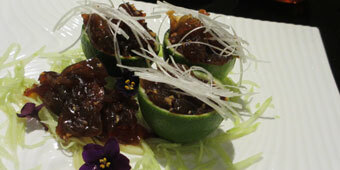 Order a side of refreshing vinegary jelly fish slices in pretty lime cups, and tofu salad with Chinese toon to balance. Add on the comfortably classy setting and sensibly translated menu, and it’s a perfect induction to Beijing. No doubt this experience will have your guests wanting more. Duck de Chine in Sanlitun’s 1949 complex is a no brainer for a second round. Just as the name mixes traditional and foreign, the birds too are an “inter-racial” breed of the English Cherry Valley and the Chinese White. As well as pancakes, your duck is served with mini hollow buns, and julienned sweet radish to strike that harmonious bite. You’re offered a swirl of sesame or peanut dressing to your sauce with a sprinkle of fried garlic. Service is impeccable. And all this while looking out onto the serene courtyard. A note on the side, duck is the prized meat of TCM (Traditional Chinese Medicine) diets, what with its cooling properties and supposed cure for lung and stomach ailments. Not that we need any other reason to get our fill. Hidden behind the LG Tower at Yonganli is this unassuming grey brick, red door entrance. But enter, and you’ll find yourself in a two-storey Qing-style mansion, and half expecting to see a Qing princess waltz by in all her silken splendour. The food at Na Jia Xiao Guan follows imperial court cooking, with signature fried prawns, an array of Chinese desserts made from beans and more beans, home-made tofu and other temptations. Plenty here too for the less-adventurous eaters. This is Beijing, so of course courtyard dining is on the cards. Hutong 44 is particularly perfect after a day winding through the hutongs and the preserved siheyuan homes around Houhai. Near the Song Qingling Residence, this classically-furnished courtyard serves up Guizhou cuisine marked by the province’s penchant for the spicy, the sour and the pickled – the classic dish being fish in soup which is dominated by tastes of, well, precisely those. There’s naturally a small yard for al-fresco eating. Unwind over their enticing rice-wines; osmanthus flower is often used to fragrance the brews, but they also have a rose option. The food from this southwestern region has sat high on Beijing’s trend-scale for several years now. And with Middle 8, In and Out and the flurry of constant new openings, you’re spoilt for choice when it comes to Yunnan. Take a gander down Baochao Hutong when you’re touring the Naluoguxiang area, and look out for Dali Ren Jia. The intimate space is decked out with eclectic knick-knacks from an old sewing machine to ethnic minority weaving and even snakes marinated in jars of what is presumably wine. You’ll find all the usual suspects: grilled Yunnan cheese, the stir-fry of diced meat, pickles and peppers, bamboo leaf-wrapped and steamed wild mushrooms and lemongrass aplenty. What’s great about this little eatery is the sensible portions within a reasonable price range, that calls for a not-so-sensible selection of orders. Don’t rely on the intriguing translations though; the pictures ought to do the job. And do steer clear of anything vaguely resembling insects, unless you want to end up with a platter of fried silk worms. Here’s a must-try delectable fusion: Yunnan-style hotpot. And you simply can’t go wrong with Xiang Cao Xiang Cao. There are several chains, and each has the same folk art decor and service with a smile that’s normally hard to come by in Chinese restaurants. They’ve thought of everything. You get an apron for the spillages, plastic covering for your phone, wipes for your glasses, hair band for the ladies, and even live singing at your table just for your entertainment. The food is just as pleasing. Get a split pot if you really can’t decide on the broth. Mixed mushroom and fungi stock is delightful with all its aroma, and the tomato-stock adds a sweet tang. Staff also instruct you in the correct order to dunk the dishes, so as to accentuate certain flavours and not to blunt others. And the best part, you can concoct your own dipping sauce from the buffet-style spread of condiments. in fact, its a crazy university.